Whether one is currently suffering from a sniffle and cough or maybe just trying to prevent infection all together, one can turn to natural remedies. Aweganics has created a Cold and Flu Fighting Collection to help in the survival of the winter cold and flu season. Natural remedies are essential to combat those nasty colds and flus. With different antibacterial, anti-fungal, antimicrobial, antiviral, and anti-inflammatory properties, they help soothe symptoms (respiratory, sore throats) and rid of those contagious germs by cleaning one’s house, surfaces, and the air. 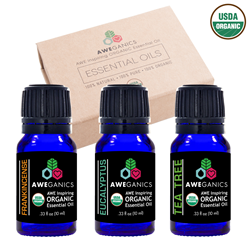 Aweganics has created an essential cold and flu fighting collection that consists of Frankincense, Eucalyptus, and Tea Tree Oils and this aromatherapy gift set can be purchased on our Amazon Store. Each of these oils are 100% Pure & Natural Essential Oils Therapeutic Grade, Certified USDA. Frankincense Oil: It is a Super-Powered Natural Formula, which offers strong frankincense aromas. The incredible therapeutic grade essential oil is fantastic for a wide variety of applications and uses, including cold and flu relief, sinus care, natural home care, hand and hair nourishment, and much more! Eucalyptus Oil: The incredible therapeutic grade essential oil is fantastic for a wide variety of applications and uses, including cold and flu relief, sinus care, natural home care, hand and hair nourishment, and much more listed below. Tea Tree Oil: Aweganics Organic Tea Tree Oil, is made up entirely of organic Melaleuca alternifolica, making it a 100% natural oil. The incredible therapeutic grade essential oil is fantastic for a wide variety of applications and uses, including cold and flu relief, sinus care, natural home care, hand and hair nourishment, and much more!